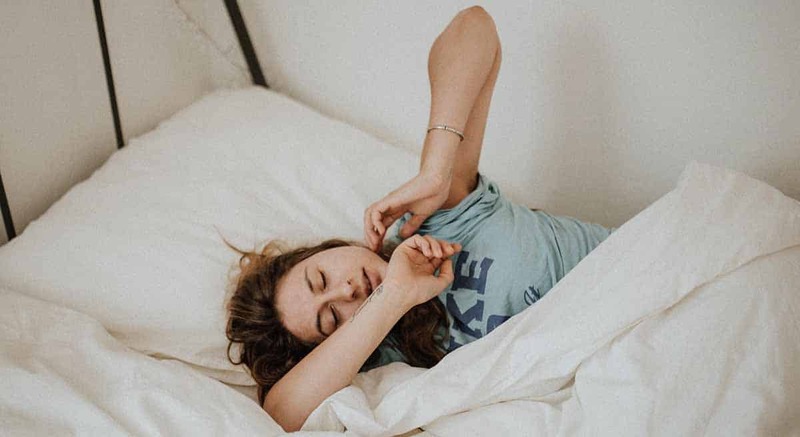 Everyone knows sleep deprivation can have a lasting impact on your general health, along with possibly exacerbating illnesses or other health issues. But did you know the way you sleep can greatly affect certain health conditions? We’ll take a look at some of the worst offenders and what you can do about them. Anyone who struggles with neck pain knows it can kickstart a chain reaction that you begin to feel all over the body. Once one thing gets thrown out of alignment, it feels like everything starts to go! So, how do we avoid this common issue? Having the right type of pillows can be a great way to combat neck pain, as they should help to keep your head at an even level with your shoulders. Try out various styles and heights of pillows to determine the right feel to prevent you from feeling like your neck is pushed too far upward or downward. Feel free to remove decorative pillows before sleeping to achieve your individual ideal neck height. The natural response to shoulder pain is to sleep on the side that doesn’t hurt. But this could cause pressure to build up in the shoulder you are sleeping on, or some restless sleepers could end up rolling on to the painful side without realizing it. Softer mattresses are available that put an emphasis on compression to prevent too much pressure from building up in the shoulders as you lie on your side. It may also be of benefit to get in the habit of lying on your back at night, to remove pressure from the shoulders completely. There can be all sorts of reasons for your spine to become poorly aligned as you sleep, including stacking your pillows too high or having a mattress that is too firm or soft for your needs. Be sure to find a product that offers the right amount of support to keep your back well-aligned. Some sleepers may need something more firm to offer enhanced support, while others will need a bit of sinkage offered by a softer mattress to keep their spines straight. Some beds offer extra lumbar support to relieve this issue. You could also try sleeping with a pillow under the knees or between them if lying on your side. One of the simplest fixes for hip pain is to just switch to sleeping on your back. This will completely prevent the mattress from being able to push back against the hip, causing pressure build-up. If you have trouble transitioning to back sleeping, you could try to find a mattress or topper that adds extra pressure relief for side sleepers. Strain may be added to the lower back and knees and when the legs are on top of each other as you lie on your side. This is largely due to improper alignment caused. Again, a pillow between the knees can keep the legs at the optimal distance apart to promote proper alignment. Sniffles, drainage, headaches. Sleeping with allergies is no fun. An adjustable bed frame that allows the sleeper to lie with their head above the rest of their body could add great relief to these issues. A simpler but similar fix would be to use pillows stacked on each other to allow the head to be raised. If the allergies are environmental, look into organic or antimicrobial sleep products to eliminate triggers. Just like with allergies, people suffering from acid reflux should try to elevate the head when sleeping to prevent too much acid from traveling back up the esophagus throughout the night. This can be achieved through pillows or an adjustable bed frame. Side sleepers who struggle with acid reflux should lie on their left side. Sleeping on the right side has been shown to aggravate reflux as this position can relax the lower esophageal sphincter, which closes off the muscle connecting the esophagus to the stomach.